Bananas are the world’s most consumed fruit which is an extraordinarily fascinating fact. But did you know that the “banana tree” is not actually a tree -- it’s the world’s largest herb. Banana tree grows, fruits, dies, and re-grows every year. Bananas contain three natural sugars: fructose, sucrose and glucose combined with fiber. Your favorite fruit has high calorific value, including 6 vitamins and 11 minerals, gives an instant, sustained and substantial boost of energy. Now, imagine eating a red banana! Yes, most of you probably do not know that there are at least 5 types of bananas different than the yellow, sweet banana you eat for snack. What Kind Of Fruit Is The Red Banana? Some people have heard or tried a red banana, which is sweeter than the regular yellow banana which is on your daily menu. Each of us is eager to try and taste new fruit, so maybe it is time to make a change and choose and buy red bananas this time. The fruit of red bananas is similar to the fruit of yellow bananas, but red bananas taste like as if you eat banana and raspberries at the same time. Red bananas come from Costa Rica and are a favorite in Central America, Mexico and in some areas in Australia. 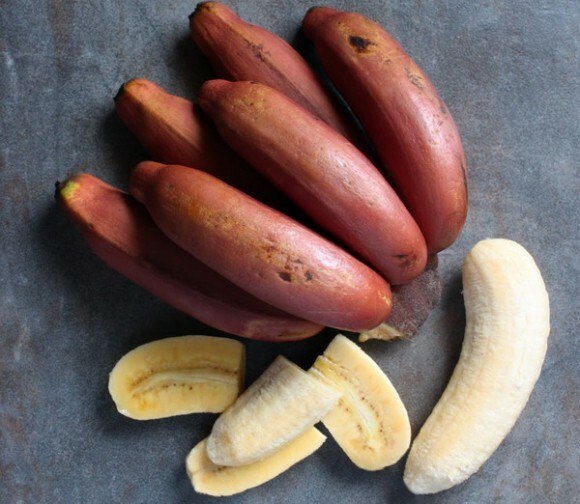 Red bananas have a distinctive red to purple skin, rather than the more conventional yellow bananas and are usually smaller than regular yellow bananas. This fruit has soft and creamy texture in cream to slightly pink color. The color comes from the beta-carotene red bananas contain, and the aroma reminds of sweet strawberries. This fruit has high nutritional and calorific value, containing large amounts of potassium, Vitamin C and beta-carotene. Medium sized fruits contain 400 mg of potassium, which covers body’s daily needs of this mineral and electrolytes. The potassium in red bananas is necessary for proper function of the heart muscle and the digestive system. Except for being delicious, red bananas are rich in Vitamin C as well. One red banana is enough to cover 15 % of the body’s daily needs of Vitamin C. Vitamin C is a powerful antioxidant which not only protects the body from diseases, but it also protects the organism against free radicals, meaning it reduces the risk of heart diseases and some cancers. Red bananas are also rich in fiber, and one red banana is covers 16% of the body’s daily needs of dietary fiber. 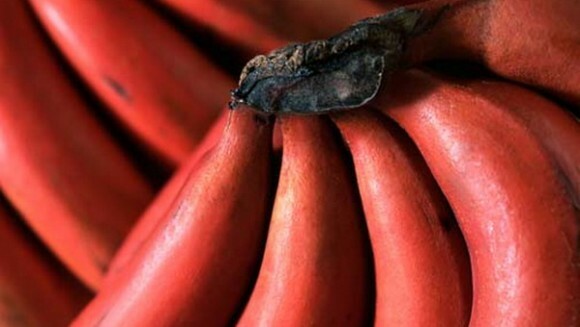 The fiber red bananas contain helps reducing the risk of heart disease and diabetes Type 2. This fruit also contains large amount of Vitamin B6, a single red banana provides even 20% of the daily recommended amount of vitamin D, and supports the metabolism of proteins and red blood cells. Aromatic red bananas have a unique flavor, similar to the flavor of their cousin, yellow bananas, but mixed with the taste of some raspberries. This fruit is excellent addition to fruit salads, your favorite ice cream bowl or the popular banana split. You can eat it raw, maybe buy dried banana chips or bake it in the oven. Red bananas are delicious fruit softer and sweeter than regular yellow bananas. 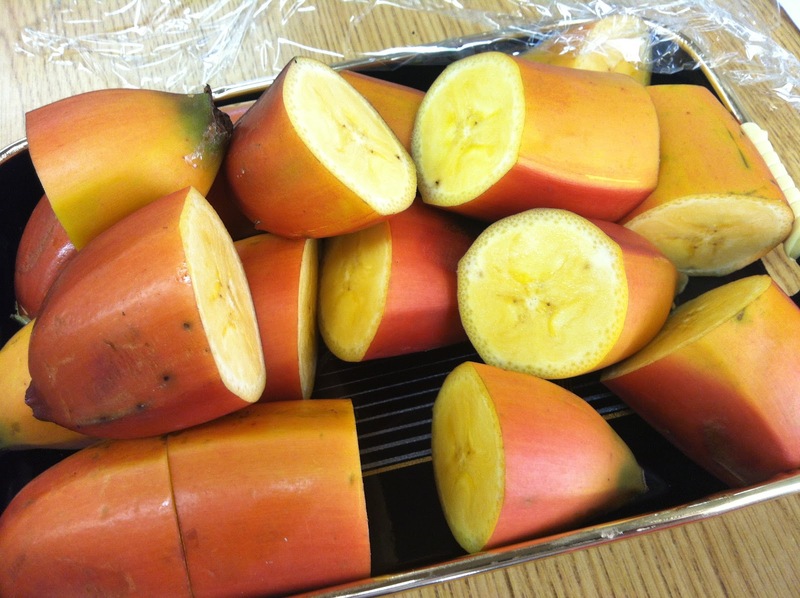 Red banana tree succeeds only in tropical and subtropical areas and the fruit is ready for use after 9 months.